The country’s worst formerly worst president told CNN today that FOX News commentators have deliberately distorted the news. Jimmy Carter said Sunday that Fox News commentators including Glenn Beck have “deliberately distorted” the news. Speaking on CNN’s “Reliable Sources” Sunday, the former Democratic president took aim at the cable news channel climate, often a target for President Obama as well who says he tries to avoid the cable chatter. The ex-president said opinions about the two channels was “part of give and take” in politics in the United States. 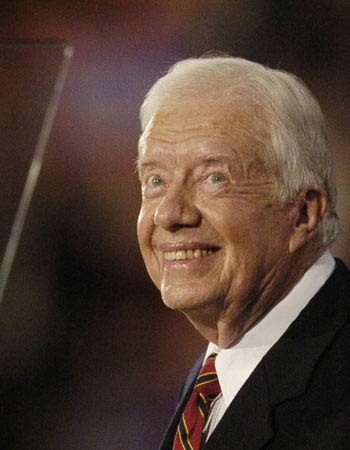 Carter also believes CNN has suffered from trying to remain nonpartisan in comparison to Fox and MSNBC. Just think… When Obama is booted from the White House in 2012, we get another 40 years of this hateful anti-American, anti-conservative rhetoric from another failed far left president.